Banking on the skills of our qualified team of professionals, we are involved in providing VFD AMC Service. 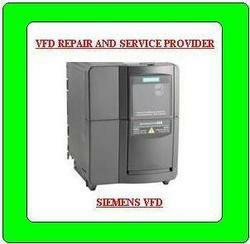 We are the leading organization in the market to offer the best quality range of VFD Repairing Service. We are the leading organization in the market to offer the best quality range of VFD Repair Service. We repair almost all types of variable frequency drives. These repairing services are imparted by our experienced professionals as per the industry set standards. They only used the latest machines and equipment while rendering these repairing services. Our firm is rendering VFD Repairing Service. To implement this service, we have selected a skillful team of professionals who hold prosperous acquaintance of this area. Furthermore, we render this service as per the details provided by our honored consumers. We are engaged in offering VFD Repair - Allen Bradley to our clients.